Colbert coined the term truthiness back when he was on Comedy Central. It is a term that comes in handy when talking about politics and about reformists. Colby Sharp sent me a link to a You Tube video which is a perfect example of truthiness. You can watch the video here. Please pay attention to the company sponsoring the video, too. Yes, here is Renaissance Learning using truthiness to suggest that their Accelerated Reader program makes kids college and career ready. They share "data" about the importance of reading each day. They call it practice; you and I call it reading. Yes, reading daily is linked to increased vocabulary. 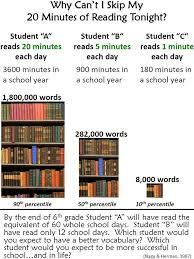 You have all seen the various charts, I am sure, showing the difference in vocabulary acquisition among kids who read 15-20 minutes a day versus those who read a shorter period of time or not at all. Here is one graphic. Here is where the truthiness comes in: the video now asserts that AR is what is responsible for more vocabulary, for increased comprehension, and for raising test scores to boot. It is NOT AR, folks, it is the READING, the investing of the time, the setting aside of time to read and read more. It has nothing to do with taking the quiz after reading the book. To suggest otherwise is truthiness. f you want to know how to motivate readers, invest in BOOK LOVE, READING IN THE WILD, READICIDE, and BOOKS, BOOKS, BOOKS! Don't fall prey to the truthiness of a corporation.